A neighbor quotes his Italian grandmother who said that a little celery makes everything taste better. I agree. Especially the celery that grows in my garden. And you can grow it too in a container or with your veggies. My gardening friend, Tori planted it in a container and cuts stalks for cooking whenever she needs it. Here’s how to have celery at the ready. Choose a smallish bunch of organic celery, but a two inch chunk of any celery will do. Let the celery end rest in water near a bright window for about a week. Change the water every few days. Though no roots develop, celery leaves will sprout. Plant the ignoble chunk of celery in a large terra cotta pot. The copper ring comes from my husband’s scientific research apparatus–a discarded gasket that may deter marauding snails. (You don’t need this). The celery will quickly grow to a few inches tall and in a couple of months you’ll be harvesting stalks of your cut and come again celery. Celery is a heavy feeder, requires rich, light soil, abundant moisture and prefers the cooler winter temperatures. Ventura is, and Venice was a prime celery growing region. What do they have in common with Point Loma? Fog and cool temperatures. My celery does well. The celery harvest in Ventura, California. 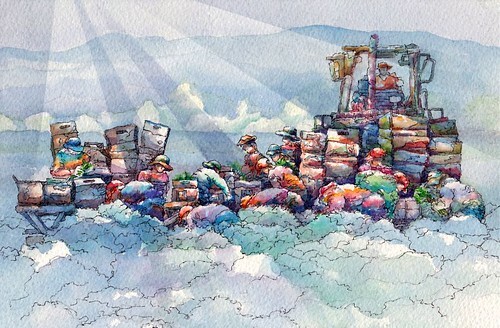 Watercolor by Gerry Segismundo. 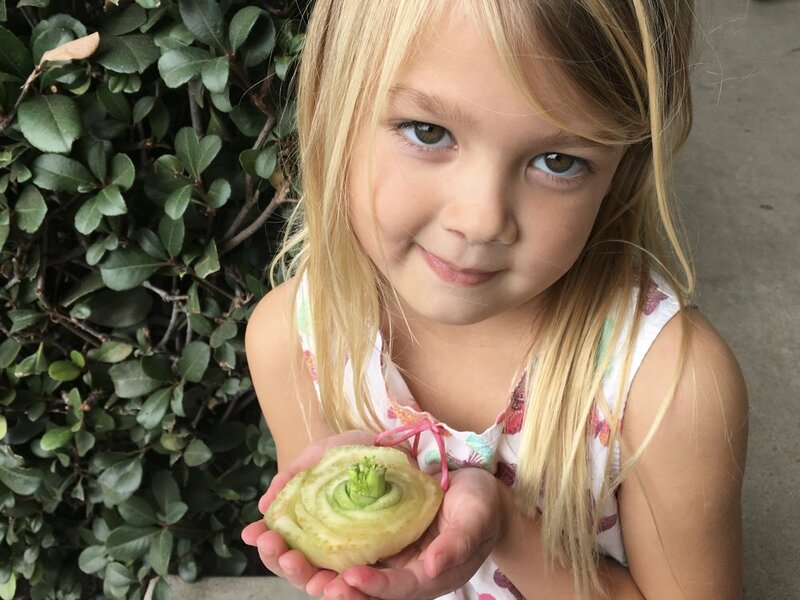 A celery plant to be and my little neighbor friend.